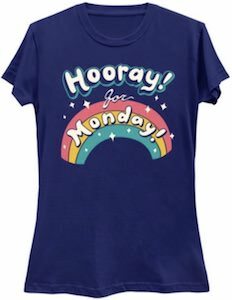 Now you can be wearing this Hooray For Monday T-Shirt. This t-shirt may not be enjoyed by lots of people but maybe it is just a bit sarcastic. On the shirt is shows the text “Hooray! for Monday!” and there are some stars too and a rainbow. You can get this fun shirt in styles for men, women, and kids and it is available in many colors and sizes going all the way to an adult size 6XL. So if you just like Monday or if you like to bug everyone around you by wearing this t-shirt on Monday’s. 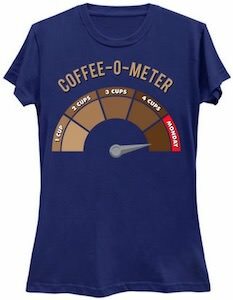 Now you can show people around you how much coffee you need all thanks to this Coffee O Meter T-Shirt. The coffee t-shirt is available in styles for both men and women and is available in sizes Small – 6XL and in a whole lot of colors. On the shirt you can see a meter that shows the level of coffee you need going from 1 cup all the way to 4 cups and finally it has a Monday level and that does mean like unlimited coffee needed. Above the meter it says “Coffee-O-Meter” so that everyone will know that you are in need of coffee. 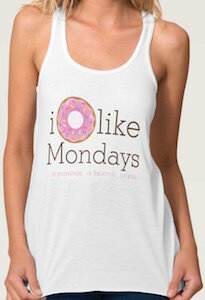 This women’s tank top is all about things you donut like. Yes I said donut because that is what the shirt says. On the tank top it says “I donut like Mondays” and the donut is a real donut and to make this top good for other things as well it says in tiny print below it “…or mornings …. or broccoli ….. or you.”. Sure all that maybe true but the last one is a bit harsh. You can get this Monday donut tank top in women’s sizes Small – XL and it is available in different colors as well to make it look fun with your outfit. If you have a hard time on Monday then you should check out this Monday I hate you too t-shirt. 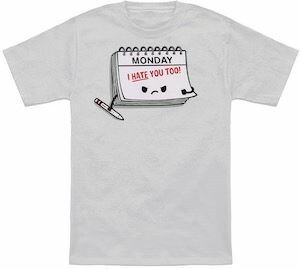 On this t-shirt you can find a calendar that is at a Monday and the calendar has a face that does not look happy at all and it is holding a red marker that it just used to write “I Hate You Too!” under the word “Monday”. 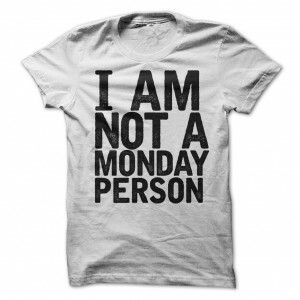 A t-shirt like this is just perfect for wearing on Monday when you have to go to work or school again. This calendar t-shirt comes in styles for both men and women and in sizes ranging from Small – 6XL and yes there are lots of colors to choose from to. Monday, who likes monday. 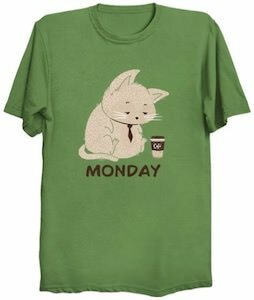 I don’t like monday and if you do not then check out this fun t-shirt. On the front of this shirt you will see a simple saying of “I Am Not A Monday Person” done in black block lettering, let everyone know how you feel about monday and maybe even speak for others. This t-shirt is available in a huge selection of sizes that will range from Small to 4XL and you have a choice of colors white, sports grey and hot pink. Made from 100% cotton to give you that perfect feeling soft shirt that is also durable to last you a long time. Get in the I Am Not A Monday Person T-Shirt. Are you one of the many people that don’t really like Monday’s? If you are then this women’s tank top maybe perfect for you. The tank top is black as that of course is the color that comes up first when you think about Monday and on that in dark letters you can find the words “If Monday had a face I would punch it”. Of course it’s a bit mean because Monday never choice to be the first day of the week but hey it makes for a fun Tank Top. The tank top has a racer back and comes in women’s junior sizes XSmall – 3XL. 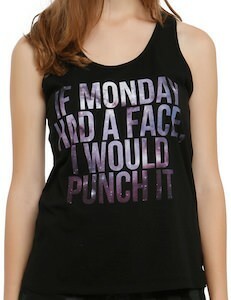 Tell the world what you think of Monday by wearing this If Monday Had A Face I Would Punch It Tank Top.